Geoff Coulson was born on 13th December 1929 on Garden Island Creek near Cygent to parents William (Bill) and Ethel Coulson (nee Bone). Geoff was one of 6 siblings Henry (Harry) Coulson Leila Seabourne (Coulson) and half Raymond, Arthur and Ellis Denny. Geoff started in the sport in 1958 and soon developed into a competent axeman and sawyer. Throughout those years Geoff has been heavily involved not only in the competitive side but also in the administration of the sport. 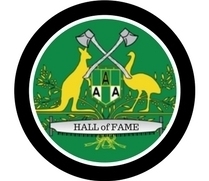 He has held positions of President, Treasurer and Committee Member of the Southern Tasmanian Axemen’s Association and the position of Handicapper/Starter for 20 years. 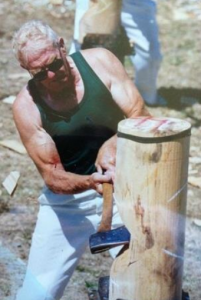 In 2003 he was awarded Tasmanian Axeman of the year by the Tasmanian Axemen’s Council. Geoff has been a staunch supporter and organiser of carnivals at Cygnet, Gelnorchy, Brighton and Bridgewater High Farm School. He has been involved with his local club at Cygnet since the sixties and has held the position of President for 18 years. In 1973/74, when the World Series Championships were held on the North West Coast, a Timber Prices s Competition was held to raise funds for each division. Each division provided an entrant and Geoff, along with his late wife Margaret and family, tirelessly supported their daughter, Sue, as the Southern Division entrant. Much personal sacrifice was made to raise approximately $4,500 for the Southern Division. In 1979, Geoff was an instigator in starting up the ‘Golden Years’ format. This was for axemen over the age of 50. This concept developed and is eagerly contested today. He also initiated the successful ‘Coach and Novice’ sawing events to encourage and promote new sawyers. He has been a great supporter of women’s involvement in the sawing and encourages the ‘Jack and Jill’ and ‘Jill and Jill’ events. More recently, he has made an attempt to rejuvenate the tree felling by introducing a two-bard tree. He is a strong support of the Ladies Committee and assists his partner Pat in their activities. Now, 55 years later, and in his 84th year, Geoff is still officiating as a starter and still organising carnivals in the Southern Division.